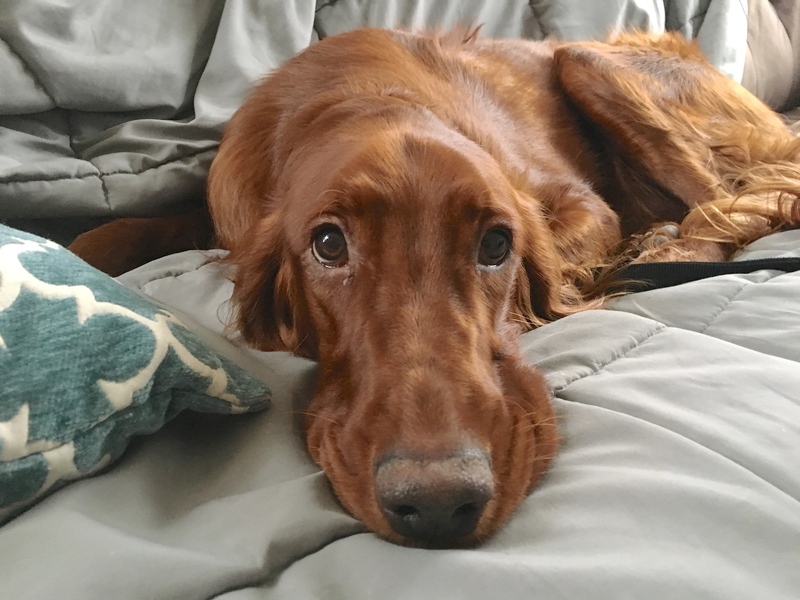 Gronk is a one-year-old Irish Setter living in Bellevue Nebraska. His family arranged a dog obedience training session with me to teach the dog to drop things, stop getting aggressive / possessive over toys and help with his fear of loud noises. I was encouraged by Gronc’s behavior when I first arrived for the session. Usually once a dog sees me coming, the excitement level hits overdrive and the dog can barely contain itself. But despite seeing me walk up and do a little narration right outside the door, he sat and waited quietly. When I sat down with his guardians, I learned he didn’t wasn’t getting as much exercise as he needed and didn’t have much discipline or structure in his life. This can easily confuse a dog into thinking they have more authority than they actually do. This misconception is one of the chief reasons I find many unwanted behaviors develop in dogs. I recommended that the guardian increase his daily exercise regimen, especially earlier in the day. While its tempting to skip walking or exercising our dogs when the weather isn’t ideal, we really put our dogs at a disadvantage. They are athletic creatures and until they get to be 2-4, not providing them with suitable exercise options is a surefire way to have a dog develop behavioral issues that can otherwise be avoided. I suggested some rules and boundaries and showed his guardians how to enforce them with body language, movement and good timing. These are more in line with how dogs communicate with one another normally, so Gronc picked them up right away. I have worked with a number of clients who wanted to use a shock collar, squirt bottle or who were told to physically interact and communicate with their dogs. But because dogs learn through association, shock collars usually backfire as the dog sees something unrelated to what it is doing when it gets the shock and this causes the dog to think its being corrected for something completely different. By using communication cues the dog recognizes and understands, many family’s report amazing improvements in their dog’s behavior right away. Gronc had a few toys, but not nearly enough. I recommended that the guardians go to amazon and pick up a number of different dog toys so that the dog has more things to occupy his time. I also wanted him to see he had so many toys that it wasn’t necessary to guard them. If you are looking for good options on dog toys, you may want to check out this post from the Quest Ed position of the website. Some dogs develop what we call Resource Guarding where the dog gets very aggressive when it has an item. If you try to approach a dog in this state of mind or try to take the item, you can absolutely get bitten. We tested out a few of his limited toy options but I didn’t see Gronc displaying any resource guarding behavior so I’m guessing this is more of a case of not wanting to give up a toy or other object and being vocal about it. Training a dog to drop things is a great skill that can help prevent resource guarding from developing. I always want the dog to do the work and this is absolutely the case when it comes to dropping items. The more interest we show in something or the more determined we are to take it away, the more valuable the item becomes to the dog. I spent the next few minutes training the dog to drop things on command so that his family members can use the same approach in the future. By helping the dog practice dropping items, when it has things that are always available, we can establish the base behavior easier as the dog doesn’t feel an urge to keep or protect something. Once Gronc reliably drops low level items, then the guardians can practice the drop using higher value items like chew bones, bully sticks, etc. Its important that the dog gets used to the human taking the dropped item away, but only after the dog can reliably drop things on command. Its also important that we trade or exchange the dropped item for a suitably valuable item or treat the majority of the time at first. Over time the trade or exchange aspect can be dropped from the equation, but not until the dog is consistently dropping things right away for at least a month. We also covered a number of training tips and dog training tricks that will come in handy when the family welcomes their first child in the new year. A big part of this is establishing boundaries now. Gronc repetitively invaded his human’s personal space and had a little bit of a clinginess to him. These are small issues now that will grow once the baby comes. By getting into a habit of defining personal space now, his guardians will help ease the transition that will need to take place when the baby comes home. By the end of the session, we were able to get Gronc to drop low value items, he was starting to follow the new rules and responding to the positive dog training and motivation to get him out from under the bed or do things he was somewhat reluctant to do prior to the dog obedience training session.